Bath linen There are 115 products. 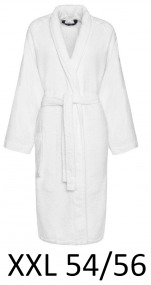 Shawl collar Bathrobe 100% cotton terry combed, 430 gr/m². Bathrobe washable at 60°C and dryer allowed. Bath mat small square colors 100% acrylic and non-slip. Size: 60x60 cm, 60x100 cm, 70x120 cm and 60x55 cm WC tower (TWC). Washable 40°C. 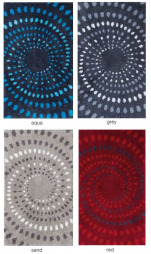 Bath mat diamonds colors 100% acrylic and non-slip. Size: 50x60 cm, 60x90 cm, 65x115 cm and 50x60 WC tower (TWC). Washable 40°C. 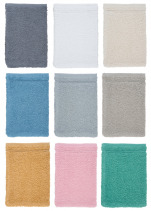 Bath mat rectangles colors 100% acrylic and non-slip. Size: 50x60 cm, 60x90 cm, 65x115 cm and 50x60 WC tower (TWC). Washable 40°C. Bath mat 4 square 100% acrylic and non-slip. Size: 60x60 cm, 60x100 cm, 70x120 cm and 60x55 cm WC tower (TWC). Washable 40°C. Bath mat vague lines 100% acrylic and non-slip. Size: 50x60 cm, 60x90 cm, 65x115 cm and 50x60 cm WC tower (TWC). Washable 40°C. Bath mat spiral 100% acrylic and non-slip. Size: 60x60 cm, 60x100 cm, 70x120 cm and 60x55 cm WC tower (TWC). Washable 40°C. Washcloth 15x21 cm, 100% terry bio cotton Fairtrade, single yarn, 450 gr/m². Belgian made washcloth woven with Fairtrade organic cotton. Thanks to a special treatment during dyeing, this washcloth is washable at 95°C and is resistant to drying and bleaching. The colors are soft, natural and soothing. Shower sheet 70x140 cm, 100% terry bio cotton Fairtrade, single yarn, 450 gr/m². Belgian made shower sheet woven with Fairtrade organic cotton. Thanks to a special treatment during dyeing, this shower sheet is washable at 95°C and is resistant to drying and bleaching. The colors are soft, natural and soothing. Finish: double stitching with sturdy hems. Bath towel 100x200 cm, 100% terry bio cotton Fairtrade, single yarn, 450 gr/m². Belgian made bath towel woven with Fairtrade organic cotton. 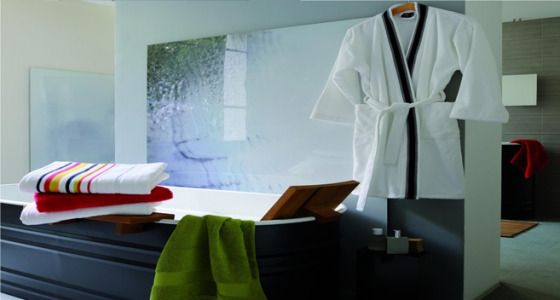 Thanks to a special treatment during dyeing, this bath towel is washable at 95°C and is resistant to drying and bleaching. The colors are soft, natural and soothing. Finish: double stitching with sturdy hems.